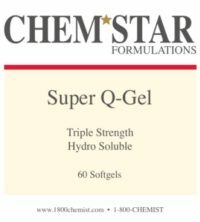 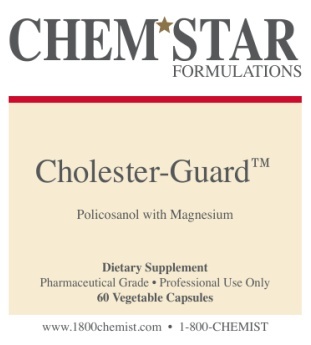 Cholester-Guard™ features Magnisol™, a proprietary blend of policosanol and Magnesium 125, Chemstar’s proprietary blend of Albion’s patented form of Magnesium Glycinate/Lysinate and the new innovative DiMagnesium Malate (patent pending). 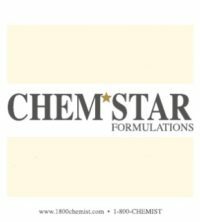 This revolutionary magnesium amino acid chelated blend is designed for maximum absorption and increased bioavailability. 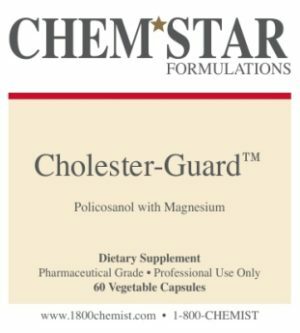 Cholester-Guard™ with Magnisol™ is designed to promote healthy lipid metabolism, moderate triglyceride support, facilitate muscle relaxation, platelet function, nerve transmission, and may enhance antioxidant protection for cardiovascular health.